When on the lookout for travel photographs and stories this fellow tends to go to a tourist spot, grab a map and then mooch off alone to explore. It is rare guided groups grab my fancy. 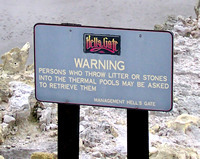 However, I reckon if you are visiting the forbidding Hell's Gate Thermal Reserve near Rotorua in New Zealand it would pay to have a guide, for the area is packed with interesting tales and happenings that you won't get without expert help. 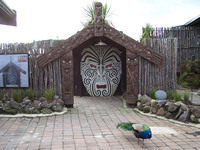 Many of them relate to the Maori tribal owners of the land, while other anecdotes are more like public service announcements telling you what has happened to folk who have wandered off the clearly marked paths and ended up in very hot water. Literally. So keeping to the paths I was led to the Kakahi Falls, which happen to be the largest hot water falls in the Southern Hemisphere. The steaming water running over them is around 40 degrees Celcius - just perfect for a luxurious bath or shower. In fact local Maori warriors used to sit on the falls after battle and clean their wounds. It seemed those treated in Kakahi Falls water healed more quickly than others - possibly due to their being tapu, or sacred. 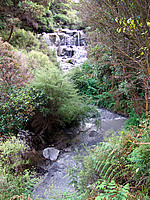 Across the waterfall is a hill that is a Maori burial ground and so one cannot discount the validity of that argument. Because the falls are sacred to Maori women are not allowed on them. My guide said one Frenchwoman decided that was very unPolitically Correct and decided to break the tapu. She broke another thing - she fell over and smashed her arm! 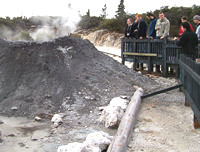 Another of the highlights of Hell's Gate is the Mud Volcano, the largest one in New Zealand. It is an amazing object and stands about 1.8 metres high and has a diameter of maybe 5 metres. 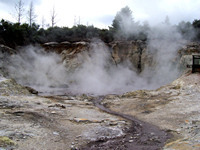 In its centre is a small crater of dark-brown-grey boiling mud. Fortunately I was able to see inside courtesy of one of the park's bosses who showed me the right side to stand on this cone. On the safe side of the dense and hard-packed mud there are no problems. One scientist picked the wrong, soft side and sank into the boiling mud up to his chest. It was helicopter trip and eight months in hospital for him. Nearby is a hole in the thin crust covering a steaming pond that marks where a young woman wandered out to get a better photo. She was lucky to only get burned up to her knees. These accidents happen rarely but they do strike home how silly people are not to stick to the approved pathways. Don't pop into this tempting pool as you'll learn that it is a rather acidic fluid. It hasn't ever been used to bathe in, although water drawn from it makes a super insect repellent for fruit and vegetables. The five pools of the area known as the Inferno vary in both depth and temperature. The deepest is 15m, while the hottest is a whopping 110 degrees Celcius. Do not throw things into these pools as any blockage of the vents could results in a new pool bursting out through pathways. This place could truly be one of the gates to hell. Its waters bubble and spout at 122 degrees Celsius and the steam that pours off it rolls and twists around the cliffs. Now this would be a perfect spot for a midnight dip - a warm green lake in a secluded area. The local Maori have used this pool as a healing bath for hundreds of years. The mud in it is used in the therapy products available from Hell's Gate. And don't forget that in the rain, the hot water features - particularly Kakahi Falls - are even more spectacular. Hell's Gate is about 16 kilometres from Rotorua on the road to Whakatane and is about a 20 minute drive from the city centre. Once you have finished your walk around Hell's Gate you may want to take time out to relax in the mud baths or get a relaxing massage in the opulent health centre. Prices: There are heaps of things to do at Hell's Gate and its spa so here is the link to its prices and services.